Don't you just love it when people are passionate about what they do? Lately I've been playing the Gas Mileage Game: with my car's feature that tells me my current average MPG, I see how much I can goose my fuel efficiency by, say, accelerating on downhill grades and coasting as far as I can on the uphills. It's a great trick to play on yourself to begin the game just before hopping onto the freeway, where even an SUV like mine can exceed 25 or even 28 miles per gallon. But after just one day driving around San Francisco, my average plummeted to 16; and even a week of highway driving couldn't lift my average MPG back up above 17. 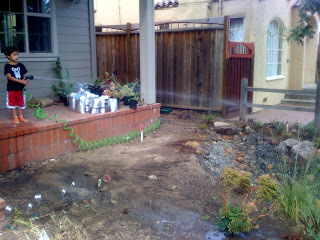 It occurs to me that landscaping is subject to the same law of averages, in terms of both functionality and aesthetics. If you have, as I do, a very water thrifty yard but even a small patch of lawn, the lawn is an insurmountable drag on your irrigation efficiency. Likewise, if 90% of your yard is gorgeous, breathtaking even, but 10% looks — well, less than breathtaking — perhaps due to outdated materials or past-their-prime plants you couldn't bring yourself to remove — that minority will bring down the appeal and allure of your entire landscape. A few of my first-time clients have been shocked when I recommend removing an established tree or shrub that, while not particularly right for their landscape, is a fixture in the yard nonetheless. But the more "average" yards I see, the less sentimental I've become: now I'll counsel that the sooner you remove an ill-fitting or underperforming plant, the sooner you can begin establishing the right plant in the right place. Similarly, I've met with home owners who have actually told me, "well, we want to upgrade the yard, but we don't want to make it too nice or anything." Which is a little shocking for me: I mean, why wouldn't you want the best space you can afford? A space designed precisely for your tastes and lifestyle, that you love coming home to or spending time in? A professionally designed garden, well maintained and thoughtfully updated over time, is what will lift the landscaping above average — and keep it there. My youngest assistant, seen here, hasn't quite got the concept down, but you can: the most efficient way to irrigate (especially in these hot dusty times) is to put just as much water as needed as close to the plant's root zone as possible. This is the principle behind drip irrigation, and it can work equally well with attentive hand watering (for which 4-year-olds are not known). The other half of the equation is the nutrition your plants are getting. It's tempting to toss a handful of Osmocote or Miracle-Gro (did you know they're both made by the same company?) at the bases of your plants. But this only supports root development at the base, where the roots already are; it does nothing to encourage them to spread out into new ground, which in turn increases the plant's ability to take up water (especially in these hot dusty times). A great way to enrich the soil on a broad scale is with consistent and generous applications of compost mulch; aim for 2-3" every 6 months. Added bonus: a healthy layer of mulch also helps prevent your precious water from evaporating, which keeps your efficient irrigation practices efficient.